If you're in the market for a NookColor then you might want to keep an eye out for the latest production run. According to Engadget, Barnes & Noble have screwed around with the internal storage. If you find a NC with a little blue dot on the box, it means that you're holding a buggered tablet. B&N have cut the user accessible storage to only 1GB. They've decided to reserve the other 4GB for content you bought from them. I suppose it doesn't matter much; if you hack it and install CM7 (or some other firmware) that restriction won't mean diddly. But it's the principle of the thing that bothers me. Barnes & Noble think that they should have more control over your property than you. Google shipping the CR-48 Chromebook – again? That attitude isn’t unique; Sony has a similar approach. And we all know what that has bought Sony (four back-end system hacks and counting). As long as B&N limits their hijinks to new sales and doesn’t retroactively change units in the field (as Sony did) they probably will only get bad press out of it. There is actually a very good reason for this change. With the old memory partion model there was only about 900 MB available for apps. Because enhanced ebook apps often are larger than 100MB, users were running out of apps space. With the new model there is 4GB more space for apps. The 1GB user memory left is still enough to store more than 1000 regular ePub books. And as the NC has a micro SD slot, for $20 you can add 16GB extra user memory. 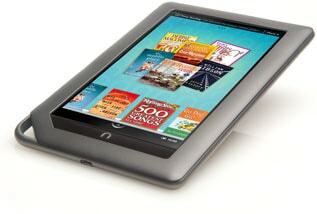 I find the new memory parition model a good compromise between ereader and tablet. Why split the partitions at all? What about the people who want to load a lot of videos? My Archos Tablet only had 256mb for apps, and they are not the first tablet manufacturer to upgraded the the firmware to give more space for apps which results in a decline for user storage. My only question would be why wouldn’t the BN books be saved in the same storage space assigned for mp3, videos etc. P.S. Never let a small bit of information get in the way of a blogger from making conspiracy claims within hours of a story breaking, on the grounds that the manufacturers’ motivations are insidious and nefarious. While I haven’t tested this with my Galaxy Tab, I would think it is the same on all android tablets. That is, with Aldiko, I am not able to store my EPUB files on the SDcard because Aldiko imports the EPUBS from the card to the device’s flash storage and buries it in another folder. The point is, the SDcard doesn’t function as extra storage in this particular case. When I was running out of room on my Archos 70, I think part of my problem was due to the fact I was using the IBIS reader whose mobile app caches a copy of the EPUB on the device. In this case, if Archos had increased the allocation for apps in the same way BN did, I may not have gotten frustrated with the device and gotten rid of it. And those EPUBs I was reading on IBIS were ones I typically sideload.